The Thames Path has recently been voted the second best trail in the world in 'Lonely Planet's 1000 Ultimate Adventures' beaten only by the Tijuca Forest in Rio de Janeiro. 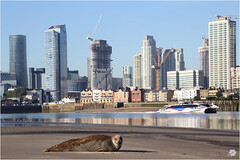 This is thanks to planning regulations state the first two metres of river front have to be available to the public and 'Natural England' who manage The Thames Path. It is one of thirteen 'National Trails' (long distance footpaths) and was established in 1996 and runs for 184 miles, 296 Km from The Cotswolds to The Thames Barrier. What has fascinated me is seeing the London part of this trail develop and change at a rapid pace over the last seventeen years. There has been an explosion of developments along this length of The Thames since 2000 when Tate Modern and The London Eye opened. With the decline of the industrial use of The Thames and the need for more and more housing, previously derelict areas have been converted into riverside apartments and sold for a premium. I used to regularly cycle from Waterloo to London Bridge along the South Bank. Now you would not consider this, there are too many people. However, there are miles of open paths in less populated areas you can explore in this way. This set of photographs takes you on a journey from The Thames Barrier to Kingston Upon Thames. Within this, there are two other journeys. One is a personal documentary covering seventeen years of a changing riverscape. The other is a historical journey found in the notes that accompany each photograph. The set can be viewed in three ways: as photographs with notes, as a slideshow, or as an interactive map. To view the photographs with notes, select 'Thumbnails'. The slideshow can be seen when you select 'Slideshow'. But note, the photos do not change automatically, so use arrows to go forward or backwards. I recommend you view this set as a map. Click on 'Map' and you will see a map of The Thames with a camera representing each photograph. Click on a camera and you will see a small photograph of the location. Some areas have many cameras so you will need to zoom into the map. Click on the small photograph and you will be taken to the larger version with accompanying notes. As you can see from the map, there are long lengths of the river with no photographs. This is an ongoing project which is intended to develop and change in the same way the river has. Prints are available starting from £10 for a superior A4 Giclee or Metallic Pearl Print which comes in a clear sleeve backed with card. P&P is free to the UK.